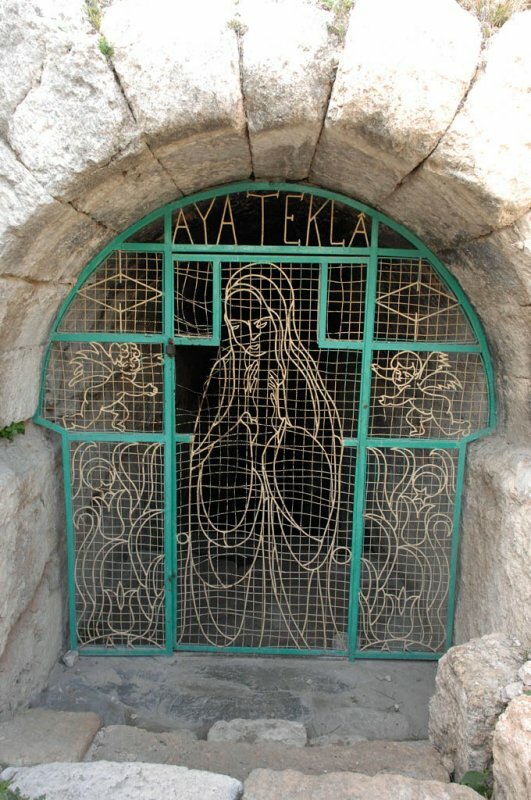 These pictures are taken at Meriamlik, an early-Christian place of pilgrimage because the place of the martyrdom of St. Thecla is situated here. It’s about 2 kilometers from the heart of town. Emperor Zeno built a basilica here in 480 (40 x 26 meters), of which only part of the apse is still standing. It is considered to be the oldest domed basilica of which the dating is certain. St. Thecla was supposed to have been a fine lady of good birth when she met the apostle Paul and was baptized by him. Her fiancée, whom she would not marry, incited Christian-bashers against her. She miraculously escaped a number of tortures, on occasion by dressing as a man. In this disguise she followed the apostle Paul who sent her back home. There now is another picture of the saint inside. This seems to be an earlier situation.